TSPSC TRT 2018 SA Biological Science Results, Certificates verification dates. TSPSC TRT 2018 SA Physical Science Final Answer keys at TSPSC /TSPSC TRT SA Physics Final Answer keys download (TSTRT SA Physics Anwser keys) : TSPSC has conducted written examinations for School Assistant – Physical Science (Except for English Medium) on 27/02/2018. The Final Keys of this subject were displayed on TSPSC website on 07/05/2018. After re-examination of final keys by the experts, three corrections occurred in the Final Keys of all mediums (except English Medium) of this subject. The corrected Final Keys will be available on Commission’s website from 02/07/2018. టీచర్ రిక్రూట్‌మెంట్ టెస్ట్‌లో భాగంగా బయోలాజికల్ సైన్స్ అభ్యర్థులకు 24న రెండో విడుత ధ్రువపత్రాల పరిశీలన చేపట్టనున్నట్టు టీఎస్‌పీఎస్సీ తెలిపింది. 62 మంది అభ్యర్థులను రెండో విడుత పరిశీలనకు ఎంపిక చేశామని, టీఎస్‌పీఎస్సీ కార్యాలయంలో ధ్రువపత్రాలను పరిశీలించనున్నామని కమిషన్ పేర్కొన్నది. పూర్తివివరాలకు తమ వెబ్‌సైట్‌ను సందర్శించాలని సూచించింది. TSPSC TRT 2018 SA Biological Science Results, Certificates verification dates: In continuation to Result Notification dated:19/06/2018 and 20/08/2018 to the post of School Assistant BIOLOGICAL SCIENCE(T/M) the following 62 candidates were provisionally shorted listed for certificate verification on the basis of OMR/CBRT Examinations held from 24/02/2018 to 04/03/2018 FN & AN notified vide Notification No. 52/2017 for a total no. of 282 vacancies in School Education Department. The candidates with the following Hall Ticket Numbers are provisionally picked up for 2nd spell for want of eligible candidates in Communities/categories/ District. The candidates who were called for Verification of Certificates have to produce the following certificates in original along with a set of Photostat copies duly attested by Gazetted Officer at the time of Verification of Certificates, failing which, they will not be admitted in subsequent process of selection. No request will be entertained for subsequent submission of any of the required certificates. In terms of the Notification, the candidate should possess the requisite qualifications as on the date of the Notification. The Commission reserves right to disqualify any candidate, if she is not found eligible for any reason at any stage. Admission to Certificates Verification does not confer ipso facto any right for Final selection. Certificate verification (2nd spell ) scheduled to be held on 24/10/2018 from 10AM onwards at Telangana State Public Service Commission, Prathibha Bhavan, MJ Road, Nampally, Hyderabad. 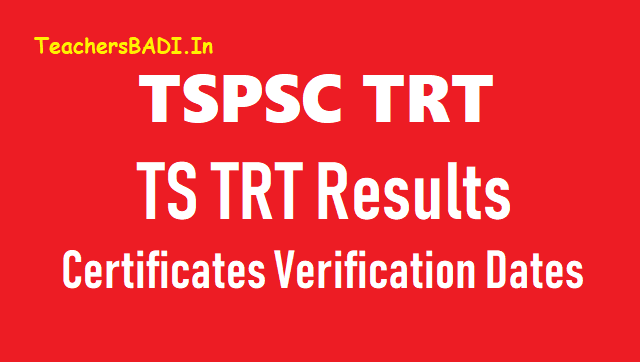 TSPSC TRT SA Physics Results: TSPSC TRT SA Physics Results, Certificates verification, TSTRT SA Physics Results, Certificates verification: On the basis of OMR/CBRT Examinations held from 24/02/2018 to 04/03/2018FN&AN to the Post of School Assistant Physical Science (Telugu, English, Urdu, Hindi, & Marathi Mediums) notified vide notification for a total no. of 132 vacancies in School Education Department the candidates with the following Hall Ticket Numbers are provisionally picked up in the ratio of 1:3 (1:5 ratio for Differently abled) for Certificate Verification. The candidates are short listed in 1:3 ratio based on Merit and Rule of reservation. - 209 candidates were short listed in 1:3 ratio with short fall for want of eligible candidates in Communities, mediums i.e., Marathi, Urdu Hindi medium posts etc. in required District / categories. TRT SA Physics Certificates verification Dates: The candidates who are called for Verification of Certificates have to produce the following certificates in original along with a set of Photostat copies duly attested by Gazetted Officer at the time of Verification of Certificates, failing which, they will not be admitted in subsequent process of selection. No request will be entertained for subsequent submission of any of the required certificates. In terms of the Notification, the candidate should possess the requisite qualifications as on the date of the Notification. The Commission reserves right to disqualify any candidate, if she is not found eligible for any reason at any stage. Admission to Certificates Verification does not confer ipso facto any right for Final selection. Note: The Pickup of candidates who approached Hon’ble High Court and obtained interim orders to allow them for further process is purely provisional and subject to outcome of respective W.Ps/W.A.s. Pending before the Hon’ble High Court. TSPSC TRT SA Physics Results [file] OR Please visit the Commission’s website www.tspsc.gov.in for the further details.